Today is a FOLLOW FRIDAY and we're sharing some of our FAVORITE HOLIDAY DECOR/DIY ideas for Christmas. We are just over 2 weeks away people! But don't stress, these ideas are easy and fun and will spruce up your home to bring in the Christmas spirit, enliven your mood, and get you excited. One of my favorite holiday movies is While You Were Sleeping. I know, not really a "Christmas" movie, but it's always a favorite this time of year. One part of that film that always strikes me for some reason is when Sandra Bullock is decorating her Christmas tree a couple of days before Christmas, throwing tinsel (90's movie) all over her tree. In this movie she has no family and very little to be excited about this time of year, and I always think about how decorating for the holidays helps bring in the cheer no matter your circumstance. I hope you enjoy these finds that will brighten up your home. I am absolutely in LOVE with these centerpieces by @abeautifulmess. I can't wait to make them to share with my family for Christmas. They are unique and beautiful, and wouldn't they just make the table smell delicious! 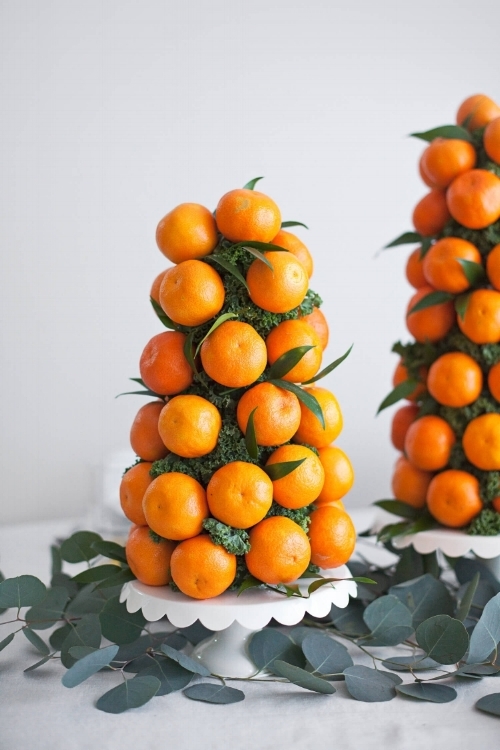 They are so easy to make using Styrofoam cones, kale, greenery, and Halos oranges. Plus - and here's my self-care plug- making things with your hands, is therapeutic in so many ways. Head to this link to see the exact instructions. Our next find is this amazing tree by designer @chelseabrink. One of my rules for designing your space is to do it however the heck you want. Yes, there are rules to design, but the objective is for you to LOVE the space you are in and that comes when you do it YOUR way. So who says a tree has to be red and green, or evergreen, or even look like a tree, heck I even saw someone with a legit upside-down Christmas tree. Let your personality shine through in your holiday decorations this year and put up a rainbow tree if your heart feels like it. Lights. Lights. Lights. Lights. They are my favorite things and my favorite part about holiday decor. To add some extra enchantment into your home, string some up in unique places. Do you normally put a garland on your stairs? Try hanging icicle lights instead. Everyone loves traditions around the holidays, but trying something new can uplift your spirits just the same. Flowers. 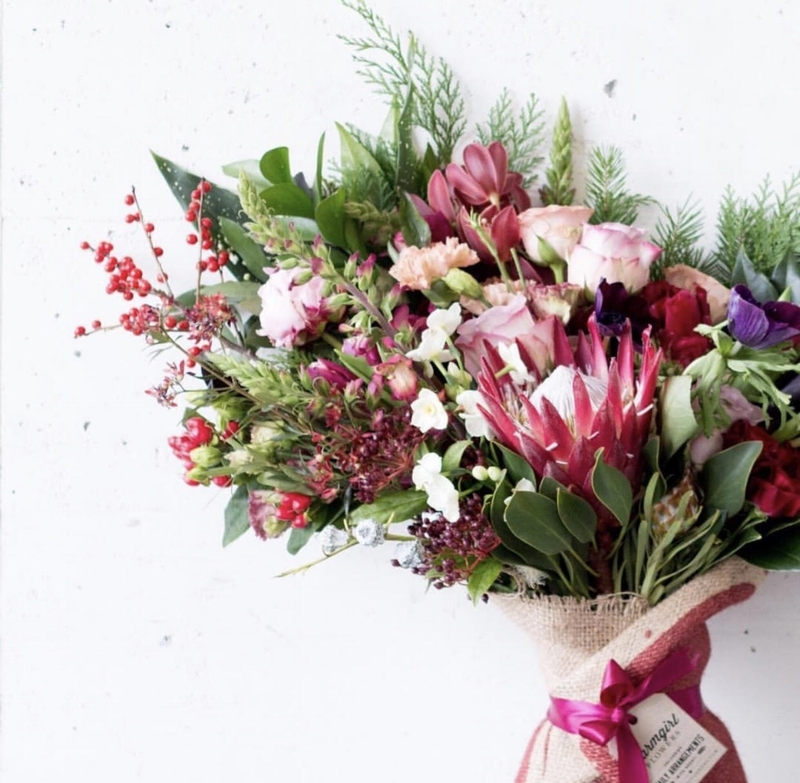 Make sure to add some florals to your holiday decor. When everything is dead outside, it's important to bring some life to the table! I have been looking for an excuse to share this company, @farmgirlflowers I am absolutely in love with their designs. I had the opportunity of working with them for a hot second while in San Francisco and was so inspired by the girl boss that created and owns this company. She started this business in her garage in San Francisco and now it's a huge success, shipping to all the lower 48 states! No matter where you are located there are amazing floral artists everywhere to be found. OR head to your local Trader Joes, Whole Foods, or flower market and try assembling your own! Our last share is not so much a decoration, but still an amazing way to bring JOY into your home for the holidays. 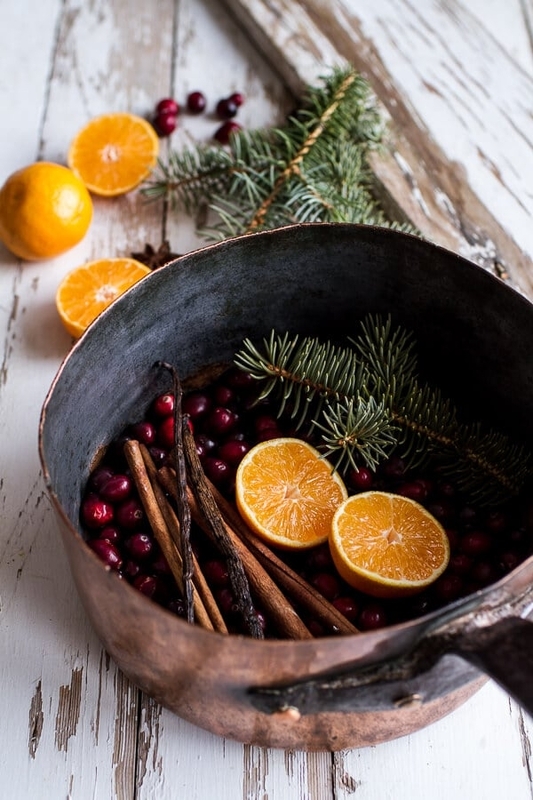 Incorporate all your senses and make your house SMELL like Christmas. Head over here at Yummy, Healthy Easy, for my FAVORITE wassail recipe of. all. time. If you don't like wassail... that's okay, we can still be friends, but check out this recipe for some non-edible holiday goodness. Go here. Let's make the house smell like Christmas. It's beginning to look, smell, and feel a lot like Christmas! !